Dragons are real. They are dangerous and they are back. With Slayers, C.J. Hill has written a fast-paced, suspenseful beginning to a new fantasy series. Dr. Alastair Bartholomew is the world's foremost expert on dragons and one of the few who believes they didn't die out centuries ago. Their eggs, he's learned, can hibernate for hundreds of years, if necessary, in order to perpetuate the species once the threats have disappeared, and several are now on the cusp of hatching. Fortunately, there are also dragon slayers, modern-day warriors whose mothers came within a certain proximity of dragon eggs while they were pregnant. This inadvertant exposure to dragons-in-embryo activates "superpowers" inherent in the fetuses' DNA - powers like flying, or superhuman strength, or heightened vision - all skills that are invaluable in fighting and killing dragons. Tori Hampton, the youngest daughter of a wealthy family, arrives at "St. George and the Dragon Camp" feeling a bit out of place. Most of the campers are five years younger than she is and, despite the fact that she's been obsessed with dragons since she was little and has been begging her parents to let her attend this specific camp for years, she's pretty sure she's made a mistake. Especially when she's placed in a cabin two miles away from the main camp with the few others her age. They immediately start testing her on horse-riding, target shooting, strength, endurance and speed while she tries to catch up with their previous years of camp experience. And then they drop the bomb that dragons exist, she's a slayer, and her duty in life will be to work with them to kill the giant lizards. She doesn't take it so well at first. Eventually, Tori comes around and sees herself as part of the team of dragon slayers. Her powers, which were late to manifest, show up just in the nick of time and she proves herself capable of handling battle with a dragon. There are hot guys, jealous girls, great new friends, evil enemies, and action-packed dragon battle sequences. Hill sure knows how to tell a story and keep it moving! 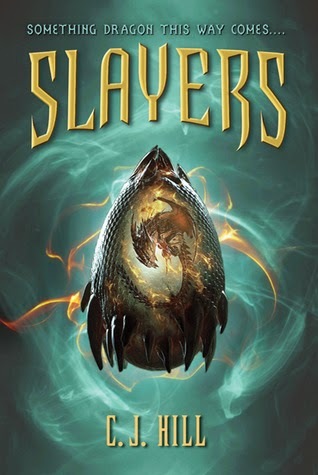 Slayers is a perfect first installment of a series. There's plenty more story to be told, but the readers have been thoroughly introduced to the world, have lived through one exciting episode with the characters, and have an inkling of some of the complications still on the horizon. I appreciate the dragon-lore Hill includes in Slayers. Rather than romanticizing dragons, she emphasizes their dangerous and uncontrollable nature. "Dragons are a wild force like the fire they breathe...For something to be good, it must be controlled, kept within boundaries. Fire, electricity, and water are like that, too. And if you think about it, so are power and love and procreation...We have no way to control dragons...It was a Pandora's box that never should have been opened. And it's our job to close it. Permanently." And she throws some pop culture references in for good measure, poking fun at Eragon fans who would likely send the slayers hate mail for killing dragons. There are several nods to LDS beliefs that I think only those very familiar with Mormon doctrine and history would notice. For example, the mention of procreation as a good, but wild, force that must be kept within boundaries is a standard image in LDS youth lessons about the law of chastity. And then there's this statement from Dr. B: "A leader shouldn't rule like a dictator. A leader should teach correct principles and let the people govern themselves." Great principle - straight out of Joseph Smith's teachings.